We have all heard the laments from rural people who work hard but just can’t seem to make ends meet. Even when they earn decent wages, families struggle to get by, let alone get ahead. Though counter to conventional wisdom, which notes the lower property costs in most, though not all, rural communities, the cost of living in rural communities can be high. So Earning It is not enough. Working families also need to Keep It. Families need affordable goods and services—located where they can easily get to them. Working families have access to and make good choices that safeguard their family income and lower their cost of living, forging stable and predictable financial lives. This means that a family sets financial goals, builds a mainstream banking relationship, improves its credit record, obtains affordable financial services, accesses available tax benefits and public and private support to close the gap between income and expenses, and obtains their family’s essential goods and services at reasonable prices. 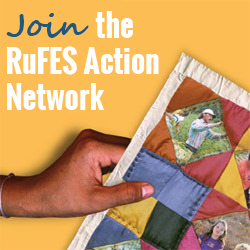 The RuFES approach includes 8 Keep It goals that, if met, contribute to sustained family economic success. Follow the links below to find common sense reasons for why a goal is important, fast facts that back up the importance of the goal, and action ideas that rural communities are using to help families plant their feet firmly on the Keep It road toward family economic success. Goal 1: Families set short-term and long-term financial goals, and attain them. Goal 2: Families use reasonably priced services, accounts and products for their savings, checking and other financial transactions. Goal 3: Families get loans they need without using predatory lenders. Goal 4: Families reduce their debt burdens and improve their credit ratings over time. Goal 5: Families file tax returns annually. Goal 6: Families secure all tax benefits for which they qualify, starting with those that reward work – the Earned Income Tax Credit and the Child Tax Credit. Goal 7: Families know about and take full advantage of the wide range of available public and private services that help reduce their cost of living. Goal 8: Families have ready access to affordable basic goods and services – food, clothing, housing, household goods, and health care.